Purchasing a Benefit Administration & Online Enrollment System? Download our step-by-step guide to help you navigate the confusing Realm of benefit administration and enrollment providers. Choosing the right benefit administration and enrollment software system for your public sector organization is a daunting task. At National Insurance Services (NIS), we know. We recently underwent this same process - shopping on behalf of our clients - and this guide is the result of that experience. NIS’s team encountered the expected, the unexpected, and everything in between. 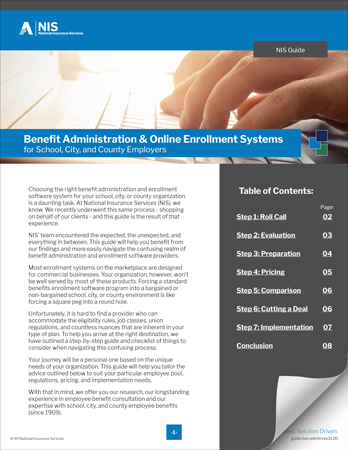 This guide will help you benefit from our findings and more easily navigate the confusing realm of benefit administration and enrollment software providers.